Amanda receives services at DSC and one of the friendliest people you will ever meet! Amanda grew up here in our very own Champaign, Illinois. She enjoys coming to DSC and seeing all of her friends every day. In her spare time Amanda likes to watch TV and movies. Her favorite TV show is Roseanne. Amanda loves Roseanne’s sassy attitude and funny quips. 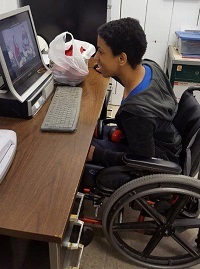 Amanda currently lives at home but is very excited to live in a group home in the future.